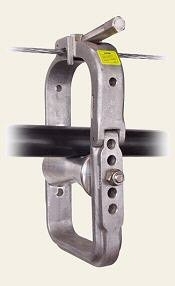 Used as a stationary block during the pulling in of heavy duty cable up to 6 in. in diameter. A 7/8 in. hex actuates a screw vise to grip the strand and keep the block in a stationary position. Available for strand sizes 3/8 to 9/16 in. (10 - 14mm). After cable and support rings are in place, the block hinges open at one side for removal.